THE National Blue Ocean Strategy (NBOS) has become a catchphrase in Malaysia these days. Anyone and everyone seems to tout their initiative as a ‘blue ocean’ programme or activity in order to jump onto the government’s NBOS bandwagon. Just as all that glitters is not gold, not all new initiatives and ideas are actually blue ocean material. Some of these new programmes are exactly that — new— but they are programmes that nonetheless are created to replace existing programmes within the same space or competition area. They are not blue ocean, but rather an improved and updated version of programmes that still exist within the same red ocean. The whole concept behind the blue ocean strategy is to succeed in an area of hitherto untapped potential — or to paraphrase a famous cult series, “to boldly go where none has gone before”. This means the creation of a new area where there is very little competition, or moving into a space where expanding does not mean filching existing customers from other suppliers. One of upsides of the NBOS is that it forces the government machinery to think in a different way. Low-cost, high-impact programmes have become the rule for programmes and activities within the NBOS universe. If previously, it was the private sector that sought to minimise costs in order to achieve a higher profit margin, it is now the government agencies which are falling over themselves to function more efficiently by eliminating the overlap and duplication of work. Territoriality is now fast becoming a concept of the past, at least where work is concerned. Different government agencies are collaborating together more productively by playing on each other’s strengths and comparative advantages. In Bagan Datuk just a few weeks ago, the Fiesta NBOS brought together more than 60 agencies with a capacity to cater for 10,000 visitors. 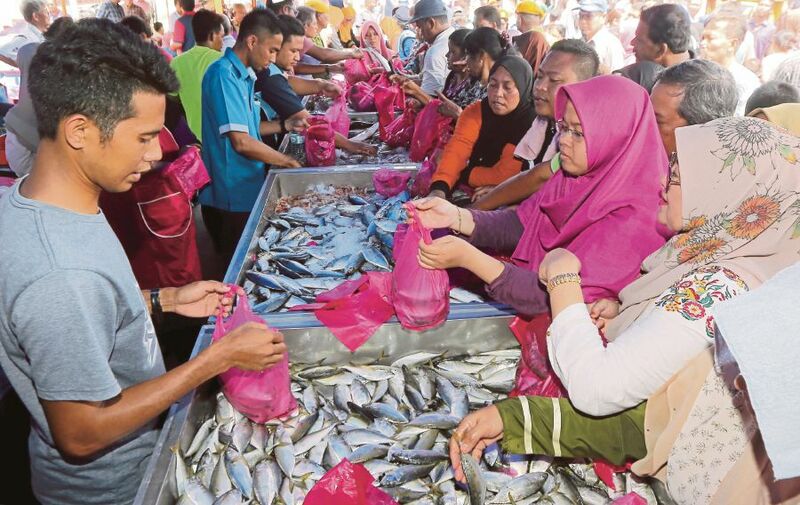 It was a roaring success, mainly because there was something for everyone, from the settling of traffic summonses to the application of PP1M affordable housing, and from the heavily discounted fish and other products of the sea to loans to start up small businesses — everything was geared towards bringing government services to the people right to their doorstep. otherwise have come into contact. The giveaways? Something as basic as food hampers and portable stoves — something which a previously-held survey told us would be of immense benefit to the people of Bagan Datuk and the surrounding areas. And, from the faces of the people who won these prizes, the survey held true. The NBOS works. It works because there is a will to become more efficient, to move with the times and play off each other’s strengths. It works because the blue ocean that has opened up also translates to an ability to serve the people better. Instead of different government agencies competing in the same area, new and more innovative areas open up because these agencies now work together. After all is said and done, the Blue Ocean Strategy as ‘introduced’ by W. Chan Kim and Renée Mauborgne is not a novel concept. Long before the phrase was ever coined, there was already a blue ocean exercise in the making. When the United Nations came into existence, it was a blue ocean strategy simply for the fact that there was no other organisation like it in existence. True, the United Nations was born from the ashes of a failed experiment in establishing the League of Nations. Unlike the League of Na tions, however, the United Nations not only took root, it con tinues to flourish to this day. Other international organisations before it were specialised organisations, focusing on specific subject matters and zeroing in on those areas where they had a comparative advantage. Everyone thought that having an umbrella organisation which covered every single issue in existence was a good idea, but too unwieldy to undertake. The UN even while it was being born, was already a massive organisation. It was meant to cover every single subject known to man, and then some, leaving nothing else to chance or outside its orbit. It created its own ocean, and in so doing, made itself indispensable to all. Today, we cannot imagine a world devoid of the UN. For all its faults and shortcomings, the UN remains one of the most successful blue ocean strategy in existence, and one that will no doubt be emulated throughout the ages. Dr Shazelina Zainul Abidin is a foreign service officer and an honorary research fellow of the University of Sheffield. She writes primarily on international affairs.